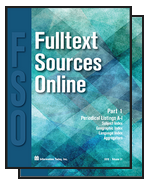 Fulltext Sources Online (FSO) is a directory of periodicals accessible online in full text through 23 aggregators and content providers. Published annually in January, FSO lists over 59,000 newspapers, journals, magazines, newsletters, newswires, and transcripts. Each title entry comprises the aggregators and databases that provide the publication online in full text. Coverage dates, frequencies, and lag times of titles appearing online, as well as ISSNs and document types, are included. Also provided are more than 45,000 publisher’s URLs indicating free archives, selected coverage, and Open Access Journals. Subject, geographic, and language indexes are supplied as well. FSO is also available in digital format as FSO Online and for license as FSOe. FSO Online provides the same complete information from FSO, and is updated weekly online. FSOe is the licensed text version of the FSO database for network or intranet use, with quarterly updates. Contact Lauri Rimler at 908-219-0088 or lwrimler@infotoday.com for pricing information. Login credentials will be emailed upon receipt of paid order. * Please add $18.00 in U.S., $25.00 in Canada and Mexico, and $45.00 outside North America.